This does not look anything like Tam’s but when comparing my little girl with my tightrope walker from January she is showing improvement which pleases me. I watched the video and then didn’t work on the piece for a week so didn’t get all the steps in at the right time. This meant I had to fudge it a bit in places. I left her with no shoes because that is how I love to walk … barefoot in the grass, wiggling my toes and feeling the coolness of the leaves. Silence can mean many different things to different people … for me it means silence of traffic and people with the poplar leaves rustling in the breeze, whispering summer, summer, summer …. this page is a spot in our little park that silences all that traffic and you can feel the difference. 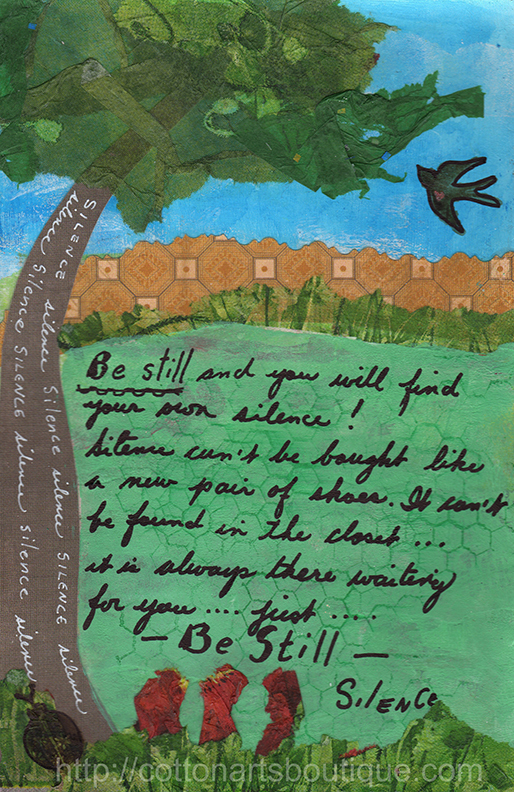 The tree and grass were created with torn tissue paper, the background is water colour crayon and I also added a bit of scrap paper for the tree line. I loved this week !! …. creating this jar was a blast and the smudging was perfect for this left hander. I love and collect turtles so of course I had to add a turtle stamp. 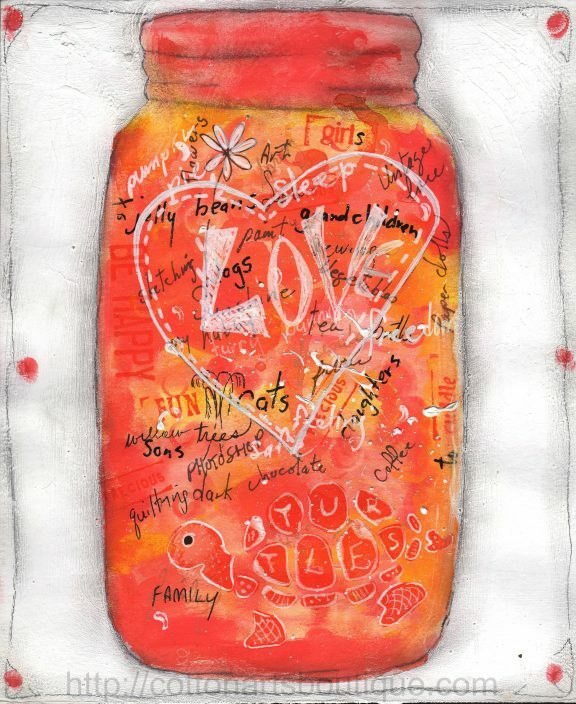 Working with water paint and mark making for the background of the jar was so much fun. 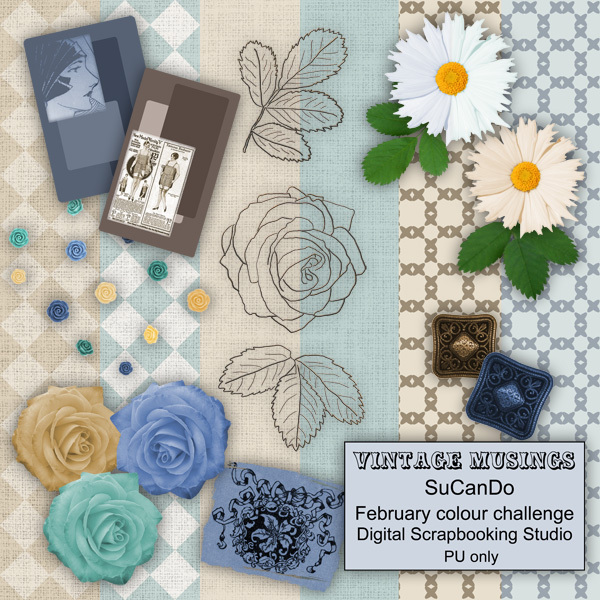 February’s colour challenge at the Digital Scrapbooking Studio with ADB Designs brought us a wonderful soft colour palette. I created both a layout and a kit for this month. Loved working with this palette. 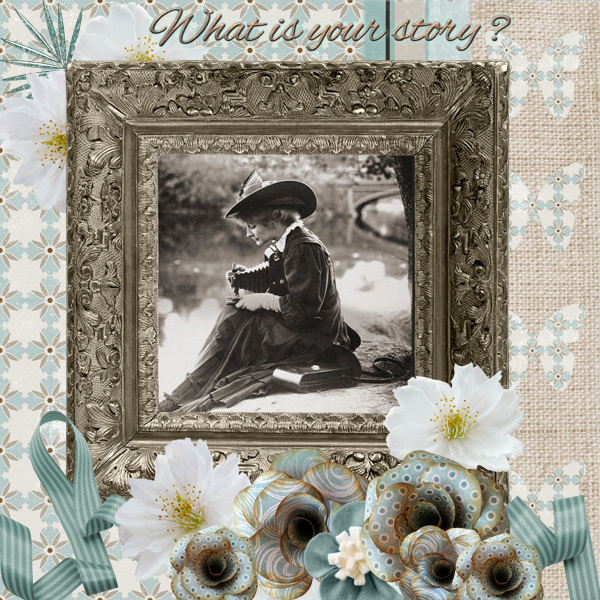 I love this layout and the vintage photo. She is telling a story while she is taking a photo to tell another story about somebody else. For this little page we were to use the colour blue and work with a crackle finish. I started with a deep blue and added white school glue, dried it with the dryer for a couple of seconds and then painted over it with the lighter blue which crackled finely. I then painted copper on the borders, more glue and then white which crackled also. This piece was one of two samples and since I liked them I used one for this piece. 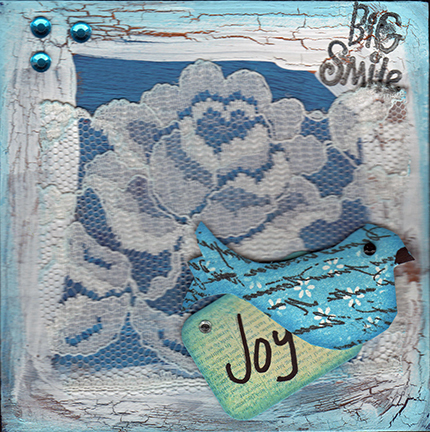 I then glued down the piece of lace and added the stamped bird and tag. 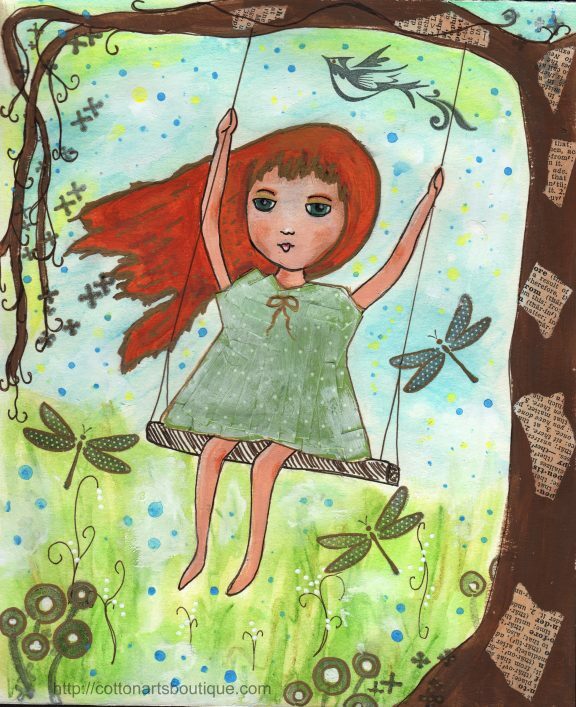 I used the stamp pad to give the edges of the piece a bit of colour and to soften them as well.